This theater play introduces a real confession of Peter Freestone, former personal manager of Freddie Mercury, in an interview with the young journalist and singer Milan Šatník. We live in a time where the media control the world - they have tremendous power and employ many talented and enthusiastic professionals, as well as many talentless scribblers. This multimedia theater play starts in the office of a tabloid magazine that focuses on the various excesses of celebrities, the wealthy or people of higher social spheres. This office is also the workplace of the young and talented journalist and musician Milan Šatník. His knowledge, talent as well as his ambitions in the music industry are high, but thanks to the chief editor he has no opportunities to get to the star bands that visit the country for their sold-out megaconcerts. His journalistic work only involves regional articles about the best products of local businesses, the achievements of agricultural cooperatives, articles on senior gatherings and anniversaries, and other non-musical topics. His attractive colleague Gabriela, however, gets tasked by the chief editor to prepare interviews with the likes of Robbie Williams, Kiss, Lady Gaga, and other music icons of the world. Gabriela likes doing these interviews, as they allow her to take selfies with these music celebrities, about whom she knows nothing, however, since she does not understand music at all. This is why her interviews look what they look like. Which is of concern to the chief editor only until Gabriela enters his office wearing a mini skirt and a revealing cleavage. It is obvious she is able to wrap her supervisor around her finger. Milan has been thinking about quitting for a long time, and one day he finally does it. The last straw is Gabriela’s departure to an AC/DC concert in the O2 Arena, while he goes to Čerčany, to a local senior club Zoubek to write an article about its anniversary. As a young journalist, singer and musician, he wants to do a job for which he was born, for which he lives with all his heart, and not a job anyone could successfully do, one that is just a job and not a mission. He goes to see the chief editor to quit and after a resulting fight, silence engulfs the office. When Milan is about to leave the office, the chief editor remembers the time he was in Milan’s age – also as impulsive and passionate – and gives him a unique opportunity: To write an interview with Peter Freestone, who was the personal assistant of the world legend Freddie Mercury and who has been living in the Czech Republic for the last fourteen years. Milan is surprised but immediately excited, for Freddie was and is his greatest musical idol. He accepts the offer instantly! The chief editor gives him Peter Freestone’s contact information and tells him that if the article is a success, he will be the one to write all the next music articles in the magazine. This theater play does not only include an interview with Peter Freestone that takes place in an old coffee shop purchased by the tabloid magazine, but also live signing by Milan Šatník, a video projection, retrospectives, and finally a concert performance by the Ultimate Rock Show project. The uniqueness of this play lies in the personal participation of the two real-life characters who play themselves. 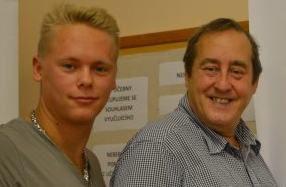 Peter Freestone as a world celebrity and guest of the interview and Milan Šatník – Eastern Bohemian singer with worldwide references (USA, South Africa, United Kingdom, Netherlands, Switzerland, Turkey) who is interested in a career his native country. If you want to play this game at your theater or other cultural institution, please contact MUSICASE Agency Thank you. 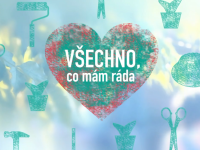 TV series - broadcast on TV NOVA.